Pulled Apart By Horses released their infectious self-titled debut in 2010 followed by sophomore album ‘Tough Love’ in 2012. Now with their third album ‘Blood’ they have taken things a step forward with wider musical and lyrical themes, embracing their love of psychedelic cinema and developing as a band whilst retaining the thrilling ‘Horses’ sound. 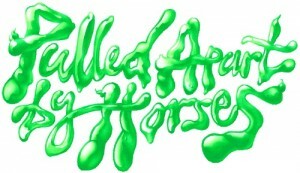 Pulled Apart By Horses can’t wait for you to hear the mind-blowing album they’ve made. Having received incredible responses across the board from critics. Surely the greatest live band in Britain? Yeah, Buddy! Be sure to catch them when they come your way!